Bronchial asthma is a chronic disease of respiratory apparatus declaring itself with periodical asthmatic fits of different strength and duration (from several hours to several weeks). The fit occurs due to spasms of small bronchi, swelling of their mucous membrane and their blocking with voluminous release of mucus. 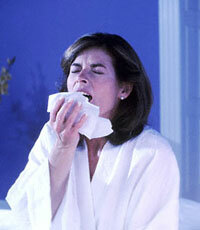 Usually asthma fits occur unexpectedly, mostly at night. They manifest themselves in labored breathing, the chest swells, and the patient experiences painful suffocation. The breathing turns to wheezing, the face becomes livid, neck veins swell. At the end of the fit viscous hyaline sputum, the cough becomes productive, the amount of sputum starts to grow and it segregates more easily. The patient can lie down and fall asleep. Besides such sudden fits there is also so-called acute severe asthma, when hours and days pass without expected relief. Famous Russian doctor Strelnikova A.S. developed a special respiratory gymnastics that can help curing several diseases. But its main application is asthma treatment. The whole Strelnikova’s method includes plenty of exercises, but in this article we will look at only those of them that are recommended for acute asthmatic fits. Before doing the following exercises you should better put a palm on your breast. This way it will be easier for you to follow your breathing in and out. 1. Sitting position, hands in different directions, 2 seconds breathing in, simultaneously pull your bended leg up to your chin. Prolonged exhalation while pulling your leg down. Than within 8 seconds say “Pfff”. 2. Sitting close to chair back, make deep inhalation in using your nose for 2 seconds and long exhalation by mouth with “Pfff” sound. 3. While sitting, hands locked behind your head – make a breath, couple your elbows together with simultaneous bending – than exhale. Pronounce “Pfff” for 4 seconds. Do the exercise smoothly 3-4 times. 4. Sit still, relax, close your eyes, slowly breathe in and out twice and hold breathing for as long as you can. Repeat the procedure 3 times. Besides breathing exercises Strelnikova recommends using medical breathing trainers and such improvised means as balloons (inflate at least 2 balloons a day) and soap bubbles. These common things can help improving both your breathing and cardiovascular systems. 1. Treating asthma with Icelandic moss is popular in folk medicine. You can use decoction or tea made from this herb. To prepare the decoction you will need 20g of well chopped Icelandic moss, on which you should pour 0,5l of hot water or milk, simmer and then let draw for 30 minutes. Take by 1/3 – 1/2 of glass of water 3 times a day before eating. To prepare the tea you should put 2 teaspoons of Icelandic lichen in 1/4l of cold water, simmer and strain off right after boiling. 2. Ledum – 25g; small stinging nettle – 15g. Cut finely and blend both components. Put the blend in 1l of boiling water. Let it draw wrapped up for 3 hours, then filter. Take by half a glass 5-6 times a day. The course should last at least 2 weeks. 3. Ephedra (leaves) – 40g; pharmaceutical chamomile – 200g; birch buds – 60g; ledum (leaves) -200g. Cut everything finely, blend thoroughly, put 2 tablespoons of the blend in 500g of boiling water, let it draw wrapped for 5-6 hours, then filter. Take warm by half a glass 3 times a day before eating. The blend is perfect for asthmatic bronchitis treatment. 4. Pine buds – 1 part; plantain leaves – 1 part; coltsfoot leaves – 1 part. 4 teaspoons of the blend per glass of cold water. Let draw for 2 hours. Then boil for 5 minutes, let draw for 15 minutes and filter. Drink this dose within a day by 3 intakes. Helps curing bronchial asthma. 5. Thyme – 10g; coltsfoot leaves – 10g; pansy leaves – 10g; elecampane rots – 10g; anise fruits – 10g. The preparation algorithm is the same as for mixture of formula #3.